Beginning Friday, August 26th at 9pm Eastern, adventurers from across Elanthia will storm Bloodriven Village to compete for power, treasure, and the ALL NEW BLOODRUNES! Once considered trash, runed rocks from beneath the cobblestones of Bloodriven are now being hailed as precious treasure. Scholars from across the lands have come to study their strange markings and chisel away at the mystery of ur-barath totems. Unravel the secrets that link moonshard pendants to BLOODRUNES. The grounds are open from August 26th until September 5th, giving you even longer to enjoy the CARNAGE at Duskruin! SEARCH around for the new stones in the sewers and READ them to learn their patterns. CARVE into an ur-barath totems with one of the chisels for sale in the village and harness the new powers of the BLOODRUNES for your completed moonshard pendants! There are several tiers of BLOODRUNES to be found, classic, divine, and LEGENDARY! And There is Even MORE Going on at Bloodriven Village! An all new giantman scriplender that will exchange your redeemed bloodscrip! Redeemed too much bloodscrip that you wanted to keep in your scrip pouch? NO PROBLEM! Just visit the scriplender at the Countinghouse and ASK her about EXCHANGING them! You asked and we listened! Many new items that were requested are now for sale! Spellbound - New inventory including a gemcutter and pattern unique to Duskruin! Gamac's Goods - New shields and unarmed equipments for sale! Skyfire - The shop is back with updated items and properties! The Written Word - Reduced prices on paper and covers! Bare Aggression - Added a paingrip, cestus, and razorpaw, as requested! The Mar and Scar - Added extraordinarily deeper and lighter containers! Scrip Shop - The shop will be returning with some new gear to fill your coffers with! CLAIM YOUR STAKE AT DUSKRUIN! AUGUST 26TH UNTIL SEPTEMBER 5TH! MAKE YOUR MARK IN HISTORY! 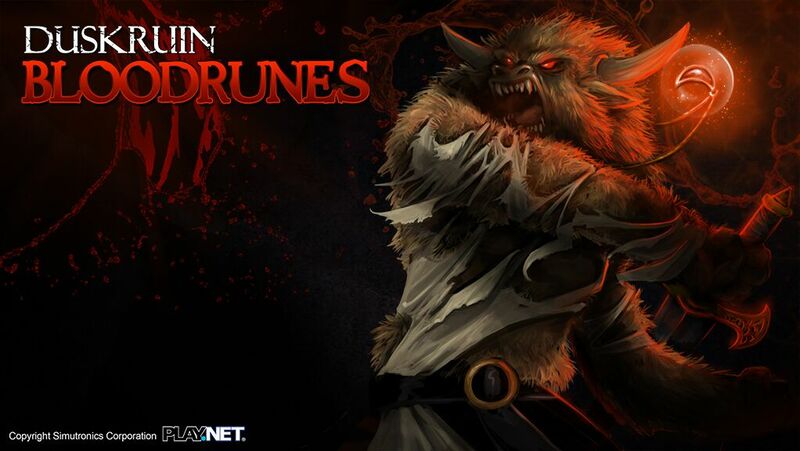 BE THE FIRST TO FIND THE EXCLUSIVE LEGENDARY BLOODRUNE! WAGONS DEPART AT 9PM EASTERN ON FRIDAY. SEE YOU THEN, IF YOU’RE BRAVE ENOUGH! Stay tuned for more details in the Duskruin Arena topic on the play.net forums!